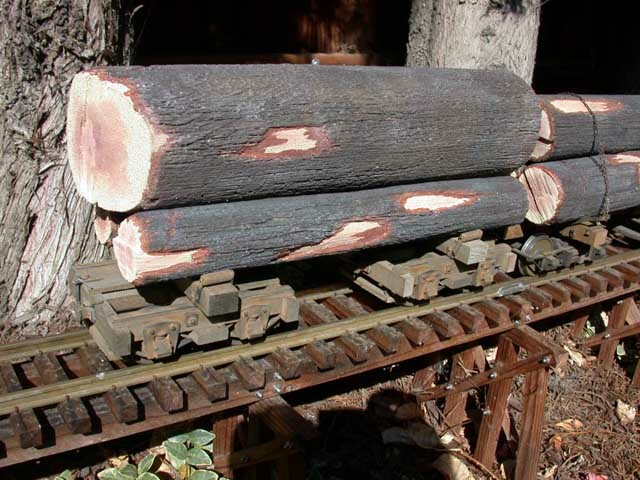 As one would expect for a logging railroad, the majority of the rolling stock consists of log cars. At this point, I have a total of four such cars, all built from Hartford Products kits. 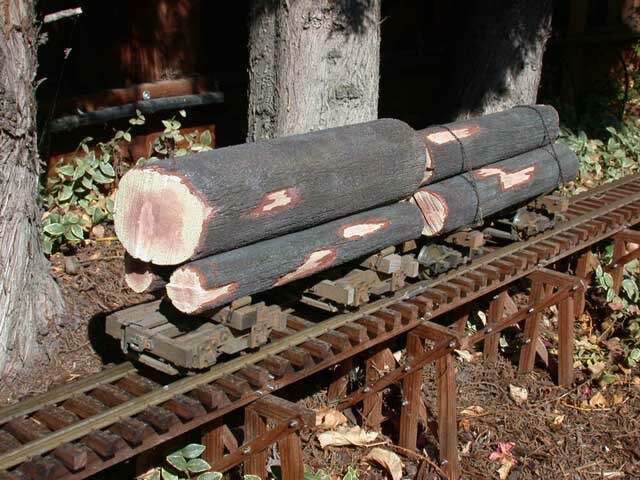 Two of these are Three Foot Logging Disconnect sets, and the other two are Santa Cruz Log Cars. Hartford kits feature exquisite detail, and nothing looks more like a wooden car than a wooden car! Being what's commonly known as ''craftsman kits,'' these are not ''shake-the-box'' assemblies, but the effort put into building them is worth it! The log loads are a new product from Nonesuch Car & Foundry. These hand-painted resin-cast log loads come in nine diameters ranging from 0.50'' (10'' in 1:20.3) on up to 2.85'' (4.82' in 1:20.3), and feature skinned bark and chain marks from the yarding process. After much searching for suitable tree branches with bark that looked realistically to scale, I'd just about given up until a friend told me about these log loads! 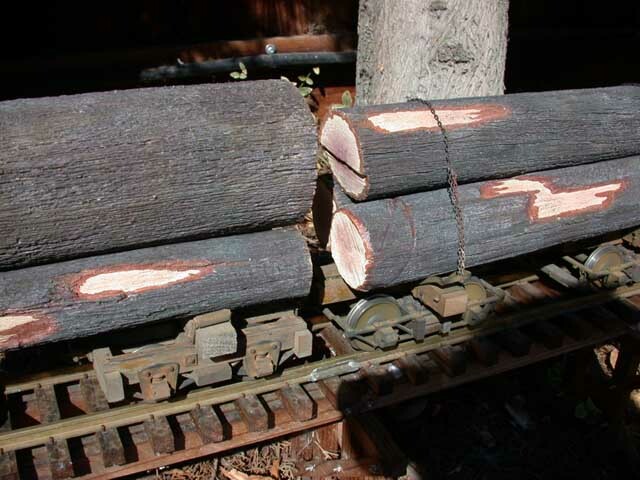 In the above photo, the left car is a Disconnect set, and the right is a Santa Cruz Log Car. 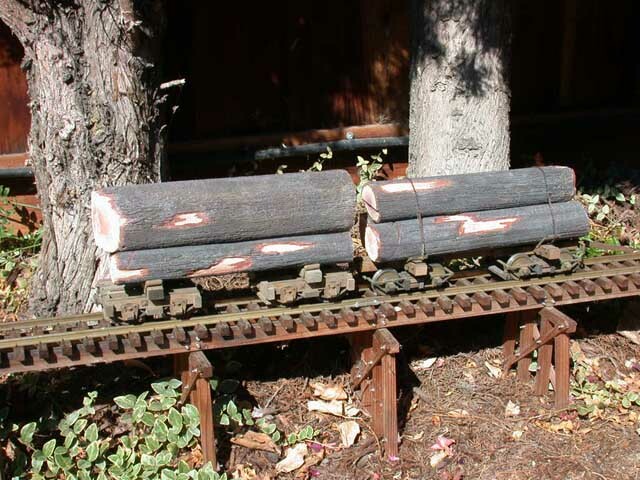 Again, the forward car is a Disconnect set, and the rear car is a Santa Cruz Log Car. Note the skinned bark on the log loads. 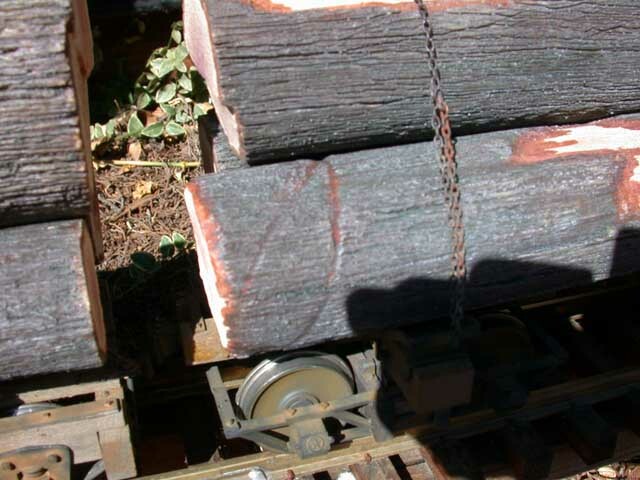 A close-up of the log loads reveals the chain marks on some of the logs. The chains and hooks are from Ozark Miniatures.